I'm BACK!!!! We have had a whirl wind of things going on and have literally been in the car for the past 3 weekends. But it's been fun and I'm glad to be home for a while. I've been trying to find some time to squeeze some crafts in here and there, so today I thought I would share this Super Quick & Easy Frame I made last night. Supplies needed are as follows. I found the thread spools at our free market last year and simply glued them to some embossed card stock and stuck it in the frame. Seriously how simple is that! You could even glue the spools to some fabric but I was lazy and didn't want to dig into my fabric stash. My Thanks go out to my Better Homes & Garden magazine for the inspiration. 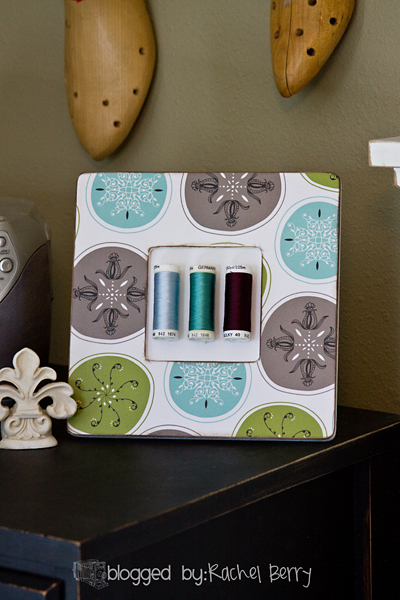 What's your quick craft for the week? Well my blogging time has run out as I have 8 kids roaming about today and they all need my attention so I better run. Love it! The colors are awesome! You are sooo creative! Very cool, but being the photographer that I am. I would really "use" it. How cute to have a picture of a child wearing those colors in it! How cute and different! I love the fact it is totally different from other things around blog land and simple! That is so cute! I have to do this for my craft room! Thanks so much, I'll be linking. Love your paper - love how cool this looks! Cute frame. Thanks for sharing. I love the pics below. Thanks for linking to my blog Blogs to Know! I came over here immediately and fell in love with your site! I couldn't even wait to feature you. Here's the link. I'll get you a button to use on your sidebar, if you would like. I'm in the process of making them right now. You are such a genius! I love this!! 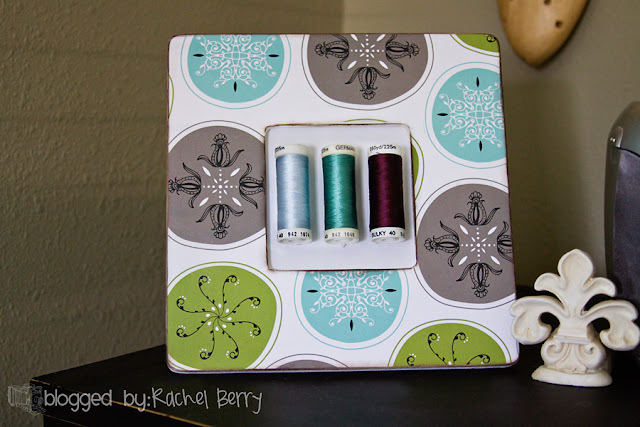 I love that your spools match the frame! I am definitely tackling this for my craft room, Rachel!